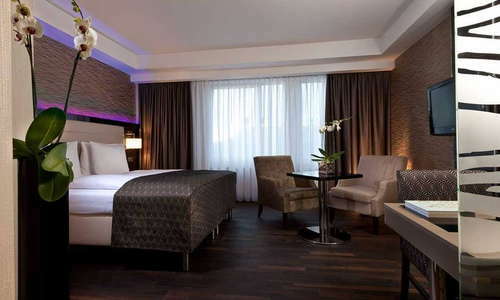 This is one of the only non-chain five-star hotels in the heart of West Berlin, and although it may not look like much from the outside, inside, the friendly staff and spacious rooms make it a popular choice, especially among business travelers. The exercise room has state-of-the-art equipment and natural light, thanks to floor-to-ceiling windows that look onto the city's skyline. The extensive spa includes a pool, ice grotto and Finnish sauna. 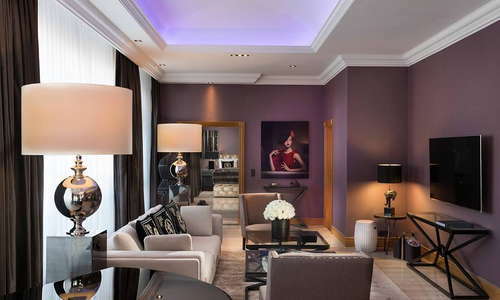 The property is a member of The Leading Hotels of the World. Large rooms feature a contemporary design, along with soundproofed windows, desks and a conference telephone (perfect for business travelers). 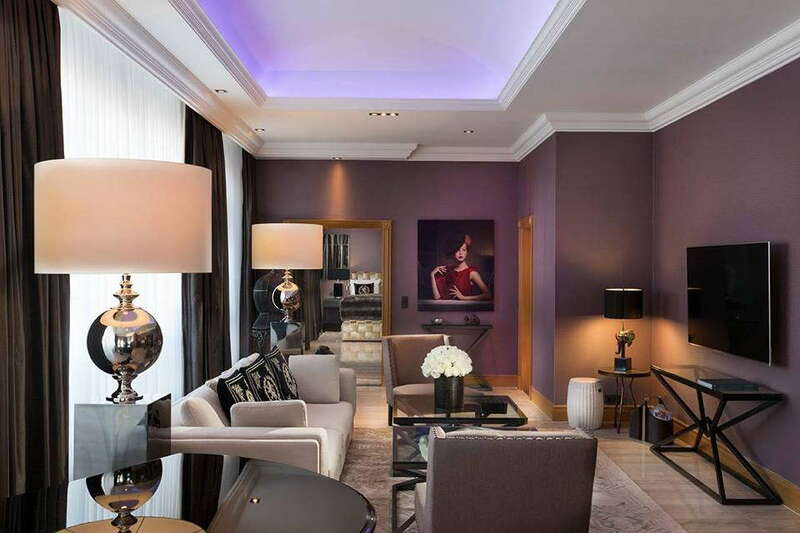 All rooms have tea and coffee-making machines and free Wi-Fi. Club level rooms have mood lighting and a seating area, plus access to the Club Lounge with food and snacks. The spacious, if nondescript, white-tiled or white-marble bathrooms (depending on the room category) have combination/shower tubs or separate showers and tubs. Larger suites boast Jacuzzi tubs. Adjacent to reception is the Lobby Lounge, with an array of seating options and a great spot to relax with a drink and a bite. The spacious spa complex boasts a Finnish sauna, ladies' sauna, ice grotto, relaxation room and heated pool; treatments include massages and Ayurvedic therapies. The spa offers a different massage each month at a discounted price. Bon Dia serves a breakfast buffet but there is not a full-service restaurant. 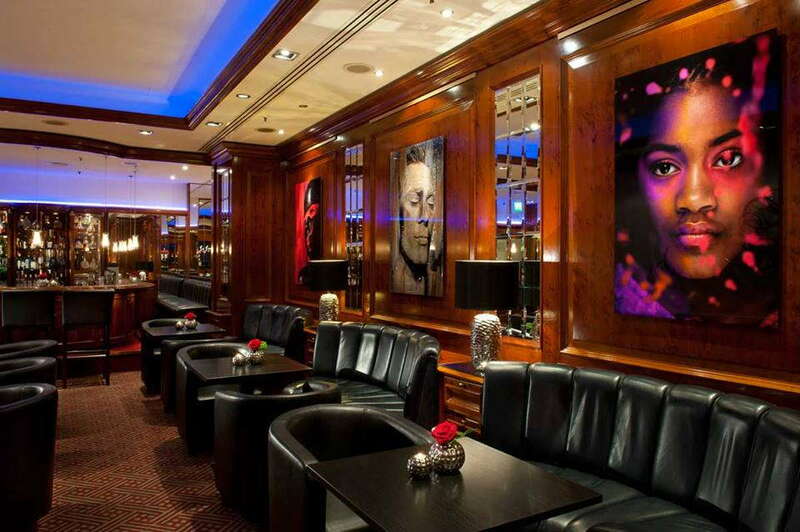 The Lobby Lounge serves a limited menu, or there is 24-hour room service. 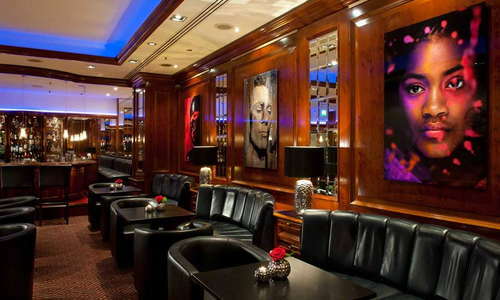 The hotel’s House of Gin bar is currently undergoing renovations; for now, the Lobby Lounge serves as a comfortable space for enjoy a cocktail with occasional live music. 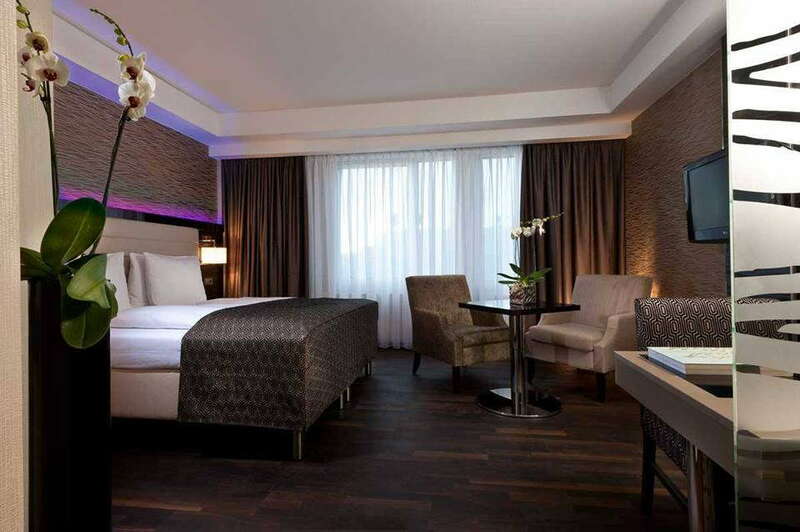 The Berlin Zoo is right across the street, Ku’damm’s shopping is around the corner and Tiergarten is a short stroll away. 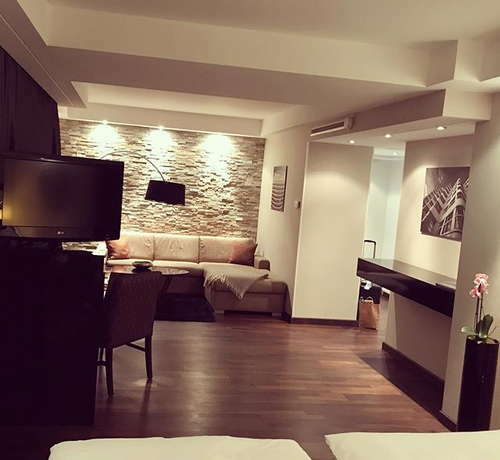 The hotel is an 8-minute walk to the U- and S-Bahn Zoologischer Garten station. The buzzy 10th-floor restaurant Neni (3-minute walk), in the 25hours Hotel Bikini, serves up Mediterranean small plates in a convivial atmosphere. The Michelin-starred Hugo’s (10-minute walk), on the top floor of the Intercontinental Berlin, offers four- to six-course seasonal tasting menus complemented by panoramic city and park views. Queue up for the elevator ride to the perennially popular rooftop Monkey Bar (3-minute walk), with a unique view of the monkey enclosure at the Berlin Zoo. 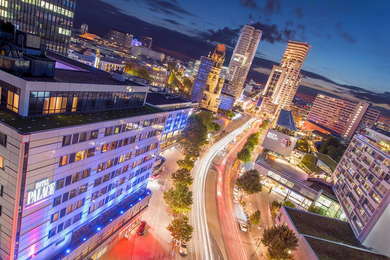 Dip into Berlin’s famous club scene at Puro Sky Lounge (2-minute walk), a multi-story bar-nightclub with DJs spinning house and hip-hop music. 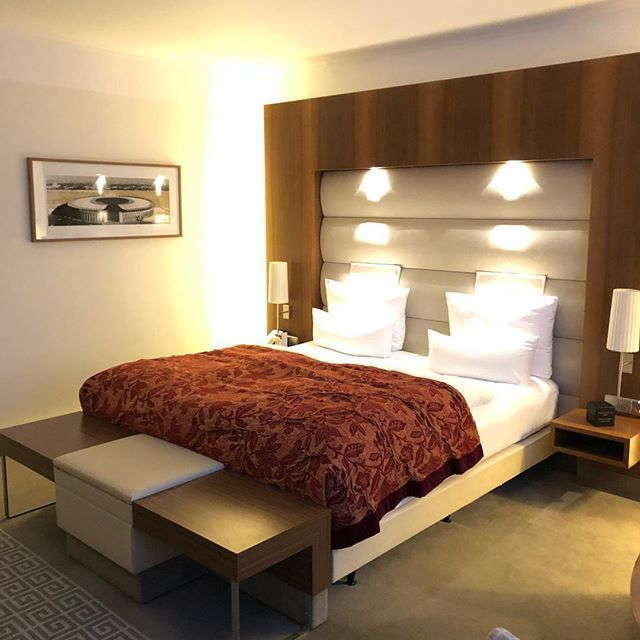 If you’re a business traveler, this hotel ticks all the boxes: spacious rooms with large desks, a business center, plenty of meeting space, and a Club Floor with its own concierge. 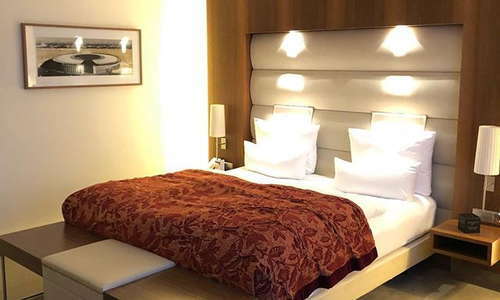 But leisure travelers will appreciate its great West Berlin location, just a stone’s throw from the Ku’damm shopping boulevard, the Kaiser Wilhelm Memorial Church, and the Berlin Zoo.